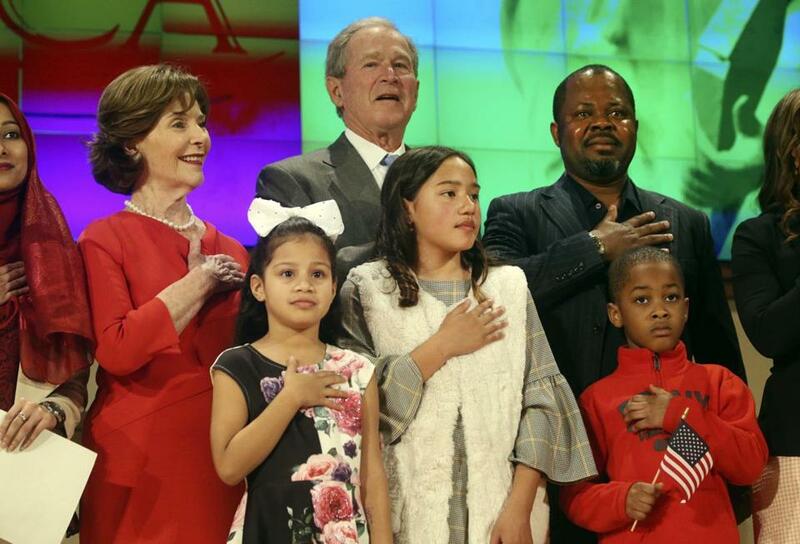 Former President George W. Bush and former first lady Laura Bush recited the pledge of allegiance along-side new U.S. citizens during a naturalization ceremony at the George W. Bush Presidential Center in Dallas on Monday. WASHINGTON — Former president George W. Bush made a rare public appearance on Monday, when he greeted new US citizens and described immigration as “a blessing and a strength,” a message that sharply contrasts with President Trump’s rhetoric on the issue. Bush made the remarks at a naturalization ceremony at the Bush Institute in Dallas. More than four dozen immigrants from 22 countries were sworn in during the ceremony. Bush, who left office in 2009, said he regretted that his own administration’s efforts at comprehensive immigration legislation “came up short.” He urged policy makers in Washington to “dial down the rhetoric” and work toward modernizing the country’s immigration laws. Bush’s remarks come days after Trump vetoed a congressional resolution disapproving of his declaration of a national emergency at the US-Mexico border. His remarks drew praise from Representative Colin Allred, a Democrat of Texas, who shared a clip from Bush’s speech on Twitter on Monday.